Wi' skilfu' hand and sang sae cheerie. That lichtly lifts its head to heaven. Where red-deer cross at mornin' early. Ere my love fail unto my dearie. And licht o' mither's love about her. To speak a word with thee. This night upon the sea. Then death alone is dear. Droop not thy head, my darling. So simple, and yet so lovely! And your hair of bonnie braid. 'Tis thy face that I behold. May I lie beneath the mould. On a mellow autumn day. I left my lovely Nell. Than the dew upon the grass. That maketh one of two. What matters if they wrong me. When I know that I am right? Although my purse be lean. Who knew? C. S. Lewis wrote a poem called 'Oxford'. 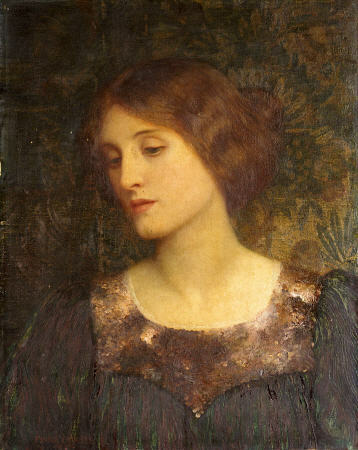 Like most of his published poetry, it was written before his conversion to Christianity, and published in 1919. He took his degree at Oxford in 1920, after his undergraduate studies were interrupted by service in World War I. Pains of the beast ‘gainst bestial solace set. The Spirit’s stronghold—barred against despair. This is another Kipling poem which came to my attention through the A Folk Song A Day project, where the Peter Bellamy arrangement was brilliantly sung (in its entirety!) a few weeks ago by Jon Boden. Like 'Puck's Song', this poem illustrates Kipling's interest in the continuity of the English landscape through two thousand years of history, with the nice addition here of the continuity of English people, too. I know someone just like Hobden! All sorts of powers and profits which--are neither mine nor theirs. I can fish--but Hobden tickles. I can shoot--but Hobden wires. Their names went down in Domesday Book when Domesday Book was made. 'Hev it jest as you've a mind to, but'--and so he takes command. In the collection of 'random things I like' which is pretty much what this blog is composed of, there has so far been one large omission. I've sometimes posted about folk songs and ballads, which I love, and which I would probably be studying right now if there were any way to prove their medieval roots (mostly there isn't). However, I also have a very soft spot in my heart for what you might call Victorian 'faux-folk' (fauk?) songs - especially the so-called 'Scotch songs' which had a big surge in popularity in the 19th century, as part of the general enthusiasm for Scotland which was nurtured by Queen Victoria's fondness for the country and the popularity of Burns, Sir Walter Scott, etc. The most famous of these 'Scotch songs' are compositions like The Skye Boat Song or Annie Laurie, which, although they may have been based on traditional songs, were essentially new compositions written in the idiom of Scottish folk song. I own a couple of wonderful books full of this stuff, with titles like The Lyric Gems of Scotland (available to read online here) and Songs of the North. Many are sentimental and some are silly; but the best have a particular quality of dignified tenderness which is utterly lacking from popular culture today. One of the many ways in which the Victorians were better than us. Here's one I especially like. Songs of the North only tells me that it was translated from the Gaelic (from a song(?) called 'Gruagach Dhonn') by 'Professor Blackie', i.e. John Stuart Blackie (1809-1895), poet and classical scholar. I'm pretty sure the tune in the book is a simplified version of this one (oddly), but I can't explain how or why... This is the sum total of my knowledge of this song. All the week was worth to me. Came thy whispered troth to me. And thy voice was melody. Brings a year of bliss to me. St Guthlac, the Mercian soldier-turned-hermit who founded the abbey of Crowland in Lincolnshire, arrived at his marshy, devil-haunted hermitage on St Bartholomew's Day, 24th August, 699 AD. Thereafter he chose St Bartholomew as his patron, and said that the apostle defended him from the demons who were constantly besieging his Fenland hideaway. Bartholomew even gave him a whip to beat off the demons; a fact apparently long remembered at Fishtoft in Lincolnshire. Shall I not rather trust it in God's hand? Whose knowledge foreknew every plan we plann'd. Whose love your love's capacity can fill. "Seals which say they keep secrets are quite common. For example, a matrix of jasper reads: CLAUSA SECRETA TEGO ('I cover closed secrets'); a silver one reads: FRANGE LEGE LECTA TEGE ('Break. Read. Cover what is read'); a gold and sapphire signet ring reads: TECTA LEGE LECTA TEGE ('Read what is covered. Cover what is read.'). These matrixes date from the thirteenth century and probably belonged to women. An undertaking to keep secrets was appropriate for sealing up a personal letter..."
M. T. Clanchy, From Memory to Written Record (Oxford, 1993), p.314. I'm going to start putting 'tecta lege lecta tege' on all my letters! Here is the seal-ring in question. It has also been found on a seal of Bardney abbey. As I mentioned when I last posted about Alphege, Archbishop of Canterbury, back in April, this year and next mark 1000 years since the Viking siege of Canterbury and the archbishop's subsequent murder. I learned today that Canterbury Heritage Museum is planning to commemorate the anniversary of the beginning of the siege in September 1011 with a Viking City Trail and other exciting activities. As someone who has often nurtured her love of Vikings at the little 'write your name in runes' section of said museum (admittedly, for the first time at the age of 19), this makes me happy. I love the name 'Vikingfest'. And words cannot express how much I want one of those 'Viking certificates'. The siege of Canterbury is not one of those events which shows the Vikings in a very good light. 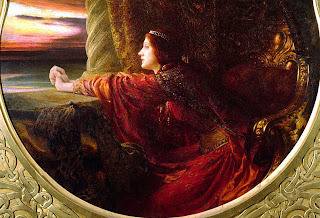 In my post about Alphege I gave the English version of events from the Anglo-Saxon Chronicle, which laments, with very untypical passion and poetic grief, how the chief city of English Christendom was reduced to pitiable wretchedness by the 1011 siege; of all the blows to English morale in the difficult period of Ethelred's reign, when Viking attacks seemed unstoppable and the official response ineffectual, the siege of Canterbury was one of the very worst. The disaster was capped by the murder of Archbishop Alphege by a mob of drunken Vikings the following year, after he had been kept for seven months in captivity. This fits very well with the conventional view of Viking brutality, and it is no criticism of the Canterbury commemoration to say that this is the version of events which it seems chiefly to recall. However, there is a Viking version of events too, and it's rather interesting and deserves to be better known. In 1011, England was under attack from a number of different groups of Vikings, working loosely in alliance with each other but led by different and independent-minded men. Among these were Svein Forkbeard, king of Denmark and ruler of Norway, with his son Cnut; Thorkell 'the Tall', a powerful Danish nobleman; and Olaf Haraldson, who, although a descendant of the kings of Norway with a claim to the Norwegian throne, was at this time a landless young man making his way in the world by plundering the coasts of Denmark and England. Svein and Thorkell had been raiding on and off in England for the past twenty years; since King Ethelred's policy (ever since the Battle of Maldon) was to pay ever-increasing amounts of Danegeld to buy them off, this was a fairly profitable activity. It is, however, possible that Svein always had ambitions to be king of England (there had been Viking rulers in England before, especially in the north and east, and he may have thought he had just as much right to those areas, which had a substantial population of Danish settlers, as Ethelred of Wessex did). We should also recall that Ethelred had been guilty of his own atrocity against the Danes - what we might today call an act of ethnic cleansing - with the St Brice's Day massacre, in which Svein's own sister and her family may have been killed. Svein and Cnut don't concern us here, at least for the moment. But at some point in c.1010 Thorkell and Olaf went into partnership together, and raided and fought several battles in East Anglia. The following summer, they laid siege to Canterbury. I know that the warrior, a terror to the Wends, fought an eighth battle at the stronghold. Mightily advanced the guardian of the warriors! The city-guardians could not defend the town of Canterbury from Olaf. Much sorrow befell the proud Portar [a name for the English, the origin of which is obscure]. eldr ok reykr, (of beldir). Lord, you made a great onslaught on the race of the kings [i.e. on the English]. Gracious warrior, you took broad Canterbury in the morning! Among the houses fire and smoke played fiercely. I have heard that you destroyed the lives of men; you triumphed there, kinsman of kings! From the Vikings' point of view, then, the siege of Canterbury was a triumph - and why not? But the murder of Alphege was something very different. The archbishop was held captive at Greenwich by Thorkell's men, but his execution (he was stoned to death with animal-bones and ox-skulls) apparently took place spontaneously, not on Thorkell's orders. If Thorkell did order it, he soon repented; apparently as a result of this, he and Olaf both shortly afterwards went into alliance with King Ethelred, and agreed to help the English king against Svein and Cnut. (Their mutual dislike of Svein probably didn't hurt, but such defections were not unprecedented; twenty years earlier, the Norwegian Viking Olaf Tryggvason - he who was probably the leader of the Vikings at Maldon, no less - had also gone over to Ethelred, converted to Christianity, and been baptised by Alphege himself). Olaf Haraldson kept his promise not to attack England again; he went back to Norway and won control of the kingdom, only to be killed in battle by his own people in 1030. He was known as a devout Christian king and on his death he, too, was considered a saint and martyr - he's the patron saint of Norway, in fact. So there's one part of the Viking story: the destroyer of Canterbury became a saint! After Ethelred's death, Thorkell went back into alliance with Cnut, who was by that time king of Denmark and England. And did Cnut, the greatest of all Viking kings, triumph in the Vikings' destruction of Canterbury? He did not. Instead, he arranged for Alphege's body to be taken back from London to Canterbury in 1023, with great honour; and thus, said a later chronicler, "he sought to correct everything wherein either himself or his predecessors had done amiss, that the stain of unrighteousness might be wiped out as well before God as before men". So there's another bit of the story: it's partly thanks to Cnut that Canterbury can celebrate Alphege at all. As summer ended summer birds take flight. "O heart, I do not dare go empty-hearted"
Today I'm in the mood for a random Rupert Brooke poem. This is called 'The Busy Heart'. He was good at list poems (as in this lovely poem) - who was it who said that "the greatest of poems is an inventory"? Chesterton, I think, though I can't remember in what connection. Rupert Brooke and various jazz songs convinced me that he was on to something. Today is the anniversary of a battle which inspired one of the greatest English poems. In 991, exactly 1020 years ago, a group of Viking raiders were met by the men of Essex at the mouth of the River Blackwater, near Maldon. After a fierce battle, the English, led by Ealdorman Byrhtnoth, were comprehensively defeated and many, including Byrhtnoth himself, were killed. Spirit must be the greater, as our might lessens. Who now thinks to flee from this battle-play. By the man so beloved, I intend to lie." It was an old-fashioned attitude even in the tenth century, the language of heroic poetry and not of real life; but at least one poet thought it noble. An Ely chronicler, writing some two hundred years later, recorded how Byrhtnoth was still honoured as a local hero. He tells a story about how Ely provided hospitality for the English army on their way to Maldon, claiming that Byrhtnoth had previously tried to have his men accommodated at Ramsey Abbey. 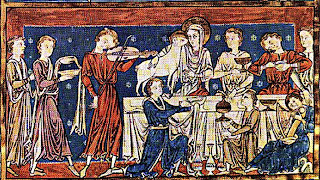 There the monks offered him food for himself and seven of his men, but in reply, the Ely writer claims, "he is said to have made the elegantly phrased response: 'Let the lord Abbot know that I will not dine alone without the men you refer to, because I cannot fight alone without them'. Very much in the spirit of the poem! Luckily the monks of Ely were more generous. After his death, his widow Æthelflæd was supposed to have made and given to Ely a wall-hanging embroidered with her husband's deeds - perhaps something along the lines of the Bayeux Tapestry? Gratuitous picture of Bayeux Tapestry. English spears. So you see, the Anglo-Saxons had their problems with looters too. "Each canon's portion was divided up each week as follows: from Saturday to Saturday, each day two loaves of the purest white bread, a third loaf not so white, these three loaves when divided carefully being certainly sufficient for six persons at one meal. Six bowls of ale were quite sufficient for ten persons at one meal. Every ordinary day there were six dishes of food, each one of a different kind, but on feast days of primary importance each man had three pittances of fod, two of feast days of secondary importance, and one on feast days of third rank of importance. There were the following additional allowances for each of the canons: from Michaelmas to the beginning of Lent a choice of twelve blackbirds, two plovers, two partridges, or one pheasant. For the rest of the year they could have either geese or chickens. 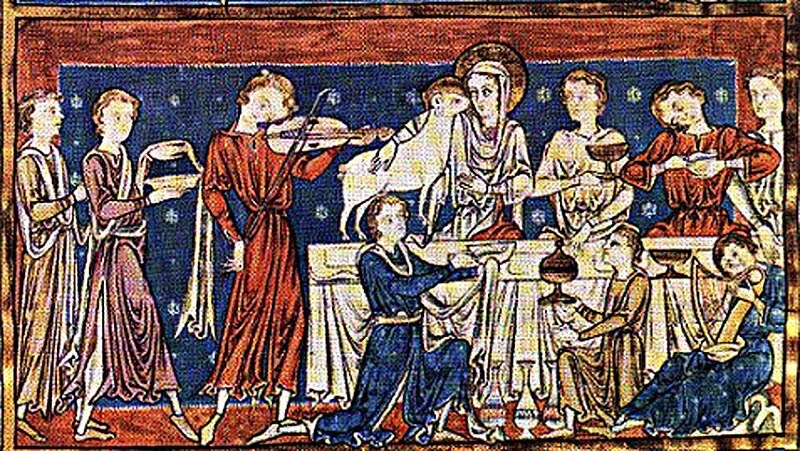 At the main festivals of the year, namely Christmas, Easter, Pentecost, and the two feast days of the Holy Cross [the patronal feast of the house], each canon was allowed wine and mead." The Waltham Chronicle: an account of the discovery of our holy cross at Montacute and its conveyance to Waltham, ed. and trans. Leslie Watkiss and Marjorie Chibnall (Oxford, 1994), p.31. Wherfor I pray both night and day. Today is the feast-day of Oswald, king of Northumbria in the seventh century, and one of England's greatest kings; he was something of a favourite hero to the Venerable Bede, and so we know rather a lot about him. An account of his life is available in the usual places. He was a popular saint throughout the Anglo-Saxon period, something of a native Emperor Constantine, promoting Christianity not only by the sword but by the preaching of good bishops: a Christian convert himself, he brought St Aidan from Ireland to spread the Christian faith to the Northumbria people. [I]t is reported, that when he was once sitting at dinner, on the holy day of Easter, with the aforesaid bishop [Aidan], and a silver dish full of dainties before him, and they were just ready to bless the bread, the servant, whom he had appointed to relieve the poor, came in on a sudden, and told the king that a great multitude of needy persons from all parts were sitting in the streets begging some alms of the king; he immediately ordered the meat set before him to be carried to the poor, and the dish to be cut in pieces and divided among them. At which sight, the bishop who sat by him, much taken with such an act of piety, laid hold of his right hand, and said, "May this hand never perish." Which fell out according to his prayer, for his arm and hand, being cut off from his body, when he was slain in battle, remain entire and uncorrupted to this day, and are kept in a silver case, as revered relics, in St. Peter's church in the royal city. Oswald was killed on the 5th August, 642, in battle against the pagan king Penda of Mercia. Bede claims that it was proverbial that he died in prayer: the proverb was "Lord, have mercy on their souls, said Oswald, as he fell to the ground." The site where his blood fell was considered to be holy, and Bede describes how "many took up the very dust of the place where his body fell, and putting it into water, did much good with it to their friends who were sick. This custom came so much into use, that the earth being carried away by degrees, there remained a hole as deep as the height of a man." Many people were miraculously cured by this holy ground. Fenmen washed their feet as seldom as possible, believing that washing would impair their strength. Relatives of a deceased husband or father took it as a compliment when told by the one who had prepared the body for burial, that 'she had never seen dirtier feet' - for this implied that the man had been exceptionally strong right up to his death. For the same reason, toenails were seldom cut, nor, in Burwell Fen, was the hair cut more often than once a year, at Reach Fair. 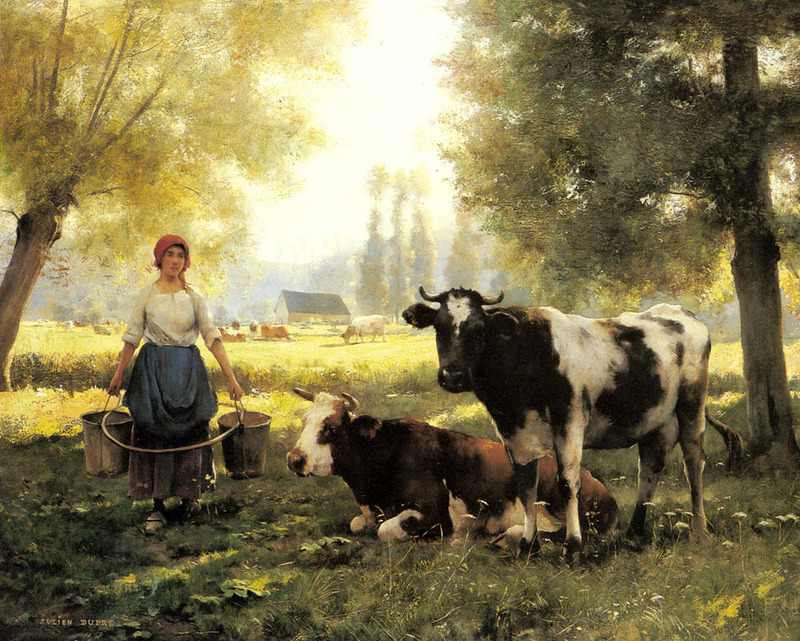 To ensure that a baby grew up to be of contented and cheerful disposition, a bunch of yarrow was often tied to its cradle... Cattle were kept docile if they grazed in fields where plenty of yarrow grew. Yarrow was a well-known love herb in the Fens. The flower, if cut on St Swithin's Day and put into a pillow, would bring great happiness to lovers who slept on it. 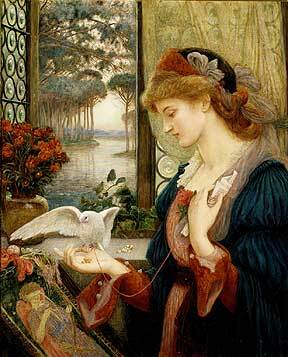 Women wore bunches of yarrow when in the company of those whose attentions they wished to attract. If a girl wished to bring a young man to the point of proposing marriage, she would go out at midnight, when the moon was full, and walk bare-footed in a patch of yarrow. 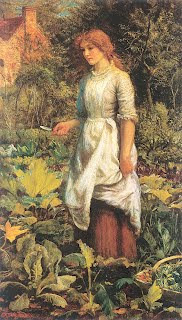 Then, with eyes closed, she would pick some of the flowers. On her return to the house, she placed them under her bed or in a drawer. The next morning she looked anxiously to see if the dew were still on the flowers, for if so, this meant she would have her wish. If not, the ritual was repeated at the next full moon. To keep a witch from entering the house, yarrow strewn on the threshold was thought to be effective. If, however, her entry could not be prevented, her powers for evil were nullified if she was made to sit on a cushion stuffed with yarrow. One belief was that, if a woman held the hand of a dead man for two minutes, she would not have a child during the next two years.